UPDATE 16: Germany's thrilling win was an impressive feat and capped off a marvelous run by the European squad. But it was equally impressive for Adidas. The apparel maker entered the tournament with sky high expectations, given its role as an official sponsor and given its rivalry with Nike. An extraordinarily successful tournament that saw record ratings ended with an Adidas-backed team winning it all and an Adidas-backed player taking the Golden Ball trophy. Congrats to Adidas on winning the Battle of the Brands -- in very impressive fashion. UPDATE 15: Argentina advanced on penalty kicks, meaning we're down to just two contestants -- a football heavyweight versus a telecom giant -- in Battle of the Brands. UPDATE 14: When Brazil lost -- in humiliating fashion -- a major brand lost its shot at Battle of the Brands glory along with them. UPDATE 13: Four brands fell when France, Colombia, Belgium and Costa Rica were knocked out. That means there are only four brands left standing -- including a couple of surprises -- in Battle of the Brands. UPDATE 12: There are just eight teams left standing -- and eight sponsors are standing along with them, including some surprises. See who's still alive in Battle of the Brands. To get a full-size graphic that you can download and print out, click here. UPDATE 11: Two more squads were sent home when Nigeria and Algeria lost their knockout stage matches. That also means sponsors Globacom and Ooredoo, respectively, were sent home as well in the Battle of the Brands. UPDATE 10: Four games in the elimination round means four more teams now have to watch the World Cup from the sidelines. Chile, Uruguay, Mexico and Greece were all eliminated over the weekend and so were Samsung, Bimbo and Puma. Nike's once dominant position grew even weaker as the apparel giant has just two squads left in the Battle of the Brands. UPDATE 9: The eliminations of Korea Republic and Russia meant two things in our Battle of the Brands: First, Nike has just three squads left and Aereflot saw their dreams dashed. Secondly, the opening round of the 2014 World Cup officially came to a close. Now that we're into the round of 16, the eliminations will be fast and furious. Check back regularly as we update our 2014 Battle of the Brands. 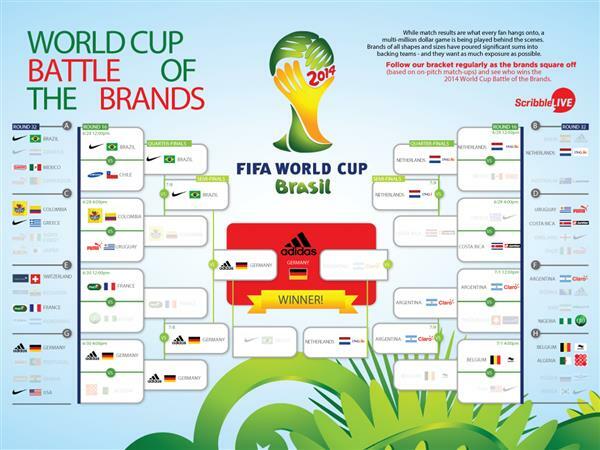 UPDATE 8: Ghana and Portugal failed to pull off the massive victory either would have needed to advance, so both are out of the World Cup -- and UniBank and Sagres went down with them in the Battle of the Brands. UPDATE 7: The teams and brands are falling fast now: Ecuador, Honduras and Iran were all eliminated from the World Cup as we enter the final stage of group play. That means three brands also saw their hopes wiped out too. UPDATE 6: Puma's bad day got worse when Greece stunned Ivory Coast with a stoppage-time victory, ending the African nation's hopes of advancing. Japan's elimination also means Kirin lost its one shot at Battle of the Brands glory. UPDATE 5: Yet another controversial loss for a tournament stalwart -- this one involving a widely reviled player and a biting -- means Puma's already thin chances are down to almost nil in our Battle of the Brands. UPDATE 4: Nike lost another horse from its stable when Croatia were eliminated after allowing a blistering three goals in 10 minutes to Mexico. UPDATE: 3: Bosnia's controversial loss to Nigeria ended its shot at advancing to the round of 16 and dealt another blow to Adidas in our Battle of the Brands. UPDATE 2: Nike got its first dose of bad news as England's hopes were dashed when Costa Rica upset Italy. UPDATE 1: After loses by Australia, defending champion Spain (yes, Spain!) and Cameroon, Qantas, Puma and Adidas (respectively) either lost their shot altogether (Qantas) or saw their chances of success shrink (Adidas and Puma). Now that we're into the latter stages of group play, teams and brands will start to fall by the wayside and fade away. Check back regularly as we update our 2014 Battle of the Brands. To get a full-size graphic that you can download and print out, click here. The 2014 FIFA World Cup is one of the most talked-about events in sports, period. Adidas expects to earn $2.5 billion from the soccer division as a result of their sponsorship. It's no wonder then that companies "fight tooth and nail" to sponsor national teams. In the quest for as much exposure as possible, brands devote millions of dollars (and hours) into their marketing efforts around the tournament. The reward? As much exposure as possible. We're following this multimillion dollar creative combat with our own game: The Battle of the Brands. After each round, we'll update our bracket to reflect the logos making it through to the next crusade with their winning team. Follow along to see which brand's investment wins the biggest reward: exposure to the world's eyeballs. To follow along as the brand battle progresses and to get the latest conversation happening around the 2014 World Cup, bookmark the ScribbleLive 2014 World Cup page.